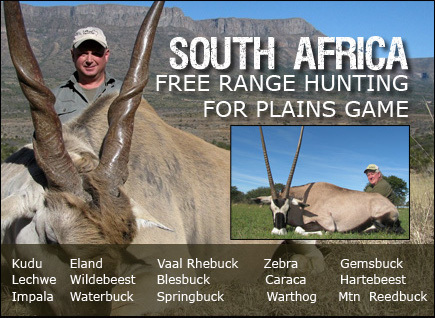 This place is an established hunting operation with a reputation as quality trophy producing outfit. Excusive access to the best free range hunting areas in South Africa and attention to detail ensures the best African Safari experience. 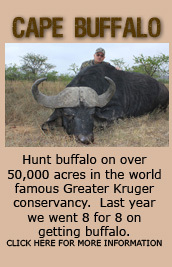 Over the years our reputation has been built on exceptional trophy quality and the fact that all 3 of the conservancies that we hunt are not high fenced. This unique setup allows us to hunt animals where they are indigenous and free ranging, this unrestricted movement we believe leads to a more challenging hunt and better trophy quality. 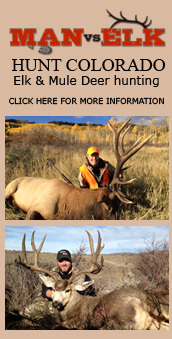 All hunters, no matter what their age, physical condition or hunting experience are welcome. We will make the necessary arrangements so all clients have a successful safari. 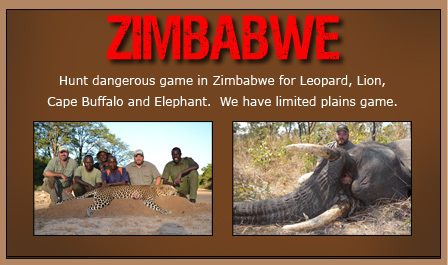 Safaris are conducted in an ethical manner. Accommodation is in traditional luxury tented camps or lodges on huge free range concessions.